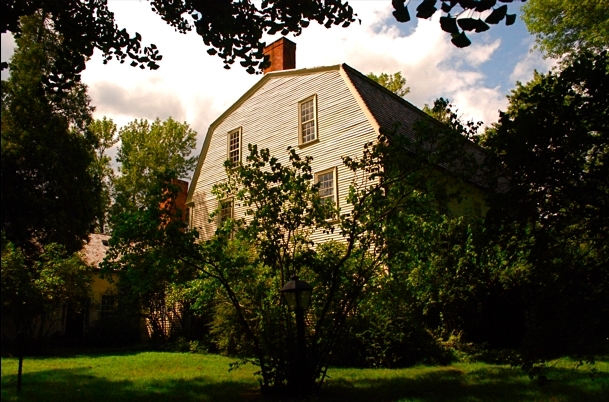 In 1752 Moses and Elizabeth Porter built their home on a piece of Hadley land along the Connecticut River known as "Forty Acres and its skirts," and the name stuck. The house and farmstead passed down through the women of the family to Elizabeth Porter Phelps and then to Elizabeth Whiting Phelps Huntington. The Huntingtons raised their family in this house and most of the letters in this collection are dated from "Forty Acres" or, as another way of denoting the Porter Phelps Huntington farmstead, "Elm Valley." More detailed information about the house and its architecture is available from the Porter-Phelps-Huntington Museum. Arria Sargent Huntington's family history, Under and Colonial Roof-Tree: Fireside Chronicles of Early New England (1891), focuses on the seventeenth and eighteenth-centuries and tells the story of this family through the story of their house.